The following examples have been sent to us from our valued customers. If you would like to add your photo(s) to the Gallery, send us an email with your photo(s) attached. Please include a description for each photo that you send. My son, Kevin, loves horses. 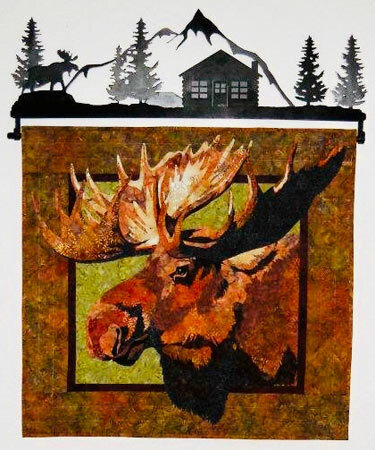 I started this for him quilt over 2 years ago using a Toni Whitney pattern. 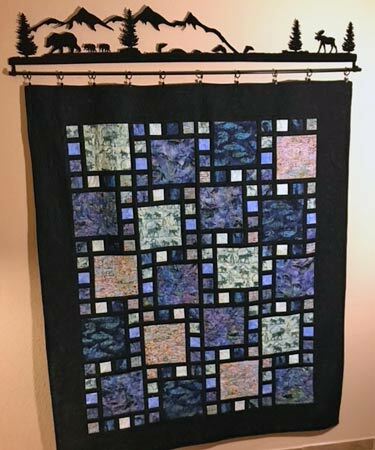 It's a lot like painting with numbers, but using fabric instead. 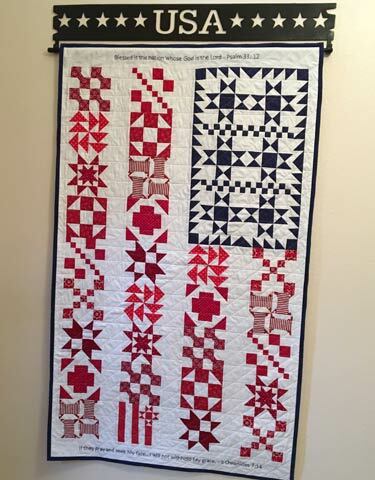 Early on I was convinced this quilt would be a hot mess. Fortunately, I was wrong. I nick-named the horse 'Fabio' after the 1980's male model with long flowing blonde hair. 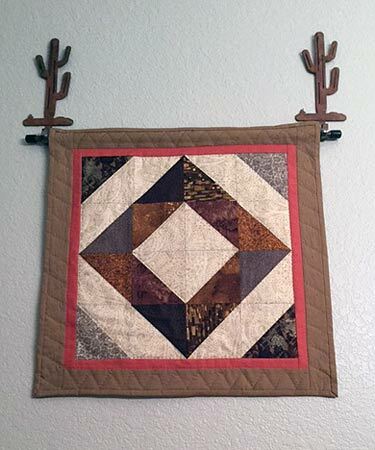 Thanks for the black iron quilt hanger; it's perfect. the first thing seen in entering our home. 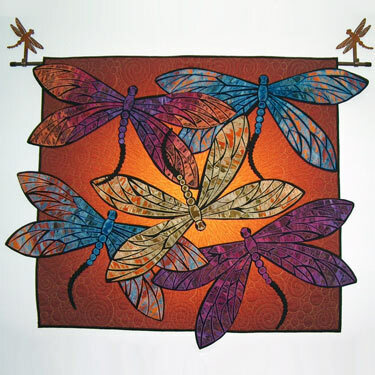 This pattern is Dance of the Dragonflies by JoAnn Hoffman. Your dragonfly hooks were the perfect hanging rod. I love all your metal art hangers. The hummingbirds are perfect for the flower garden that took my mother and me 44 yrs to make. 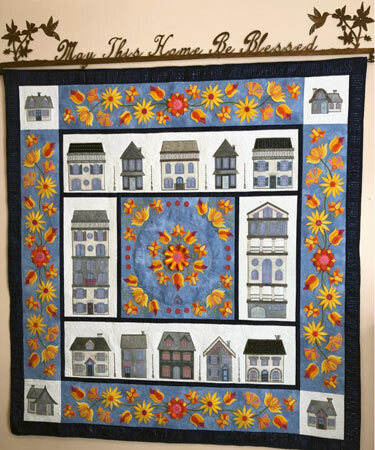 Here is a photo of my quilt on one of your hangers. I think they complement each other well. 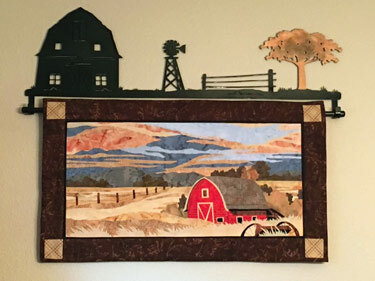 When you've made a special wall quilt and want a well made hanger come to this shop. 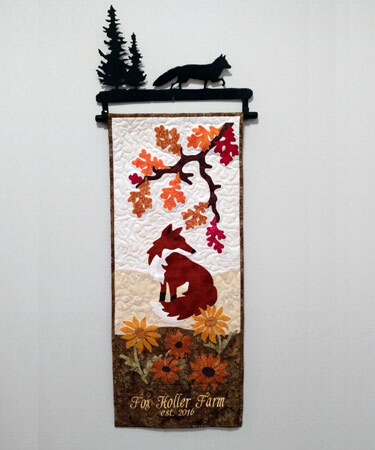 Here is a picture of one of my quilts on one of your hangers. I am so pleased with all of your hangers. 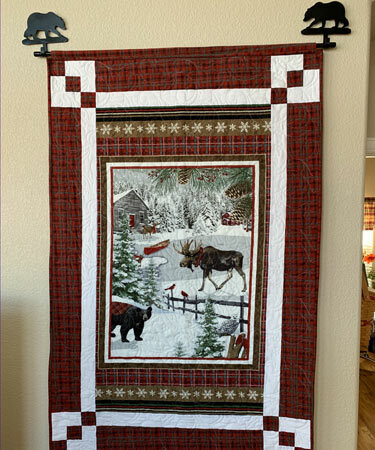 I am SO pleased with your quilt hanger...cannot resist sharing the results of teaming up with your beautiful work. 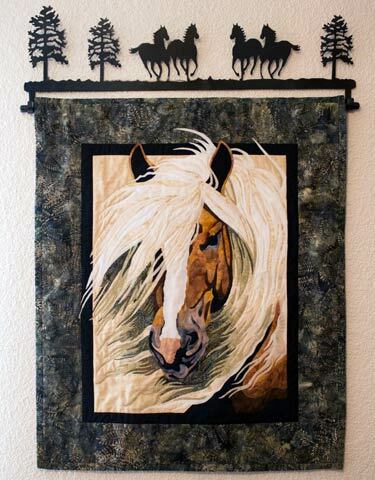 It lives up to my wildest dream that my creation will be something to behold for we who are horse crazy! Many thanks. 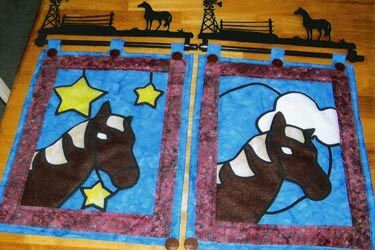 Quilted Horse Scene Quilt made for my niece. 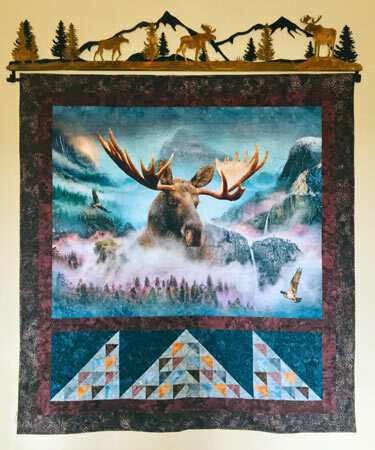 It's about 24" x 32". Here is how I used my recent purchase. It looks great. 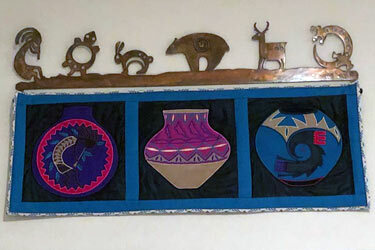 However, the actual hanging rod is a tad shorter than the wall hanging. 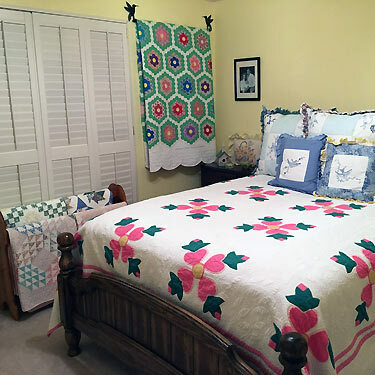 and used your quilt hangers. By the way, I love the hangers. 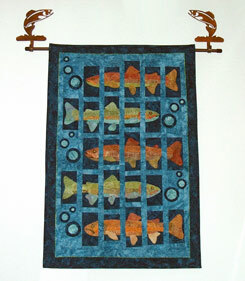 Thank you so much for customizing your regular version of your quilt hanger. 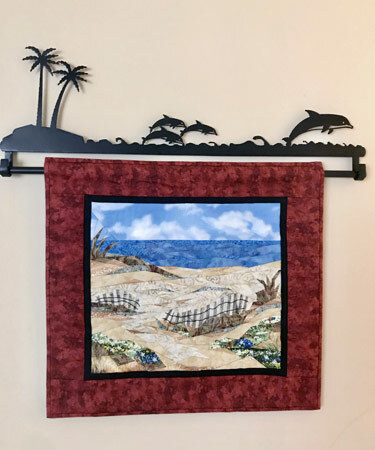 I needed a wider/longer rod and also a hanger that would accommodate a thicker blanket, and you were able to adjust your design. 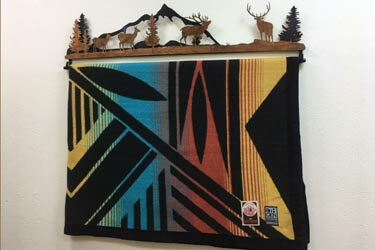 I finally was able to have your work hung in my office, and it is just beautiful (as you can see below). 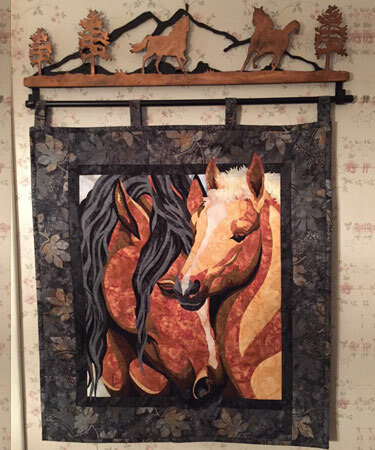 The quilt rack is a hit! She loves it! We are very pleased with the work! Excellent work and very timely! 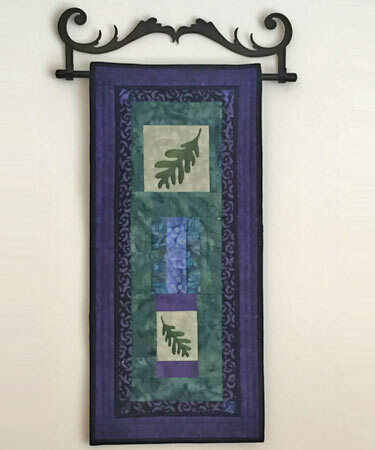 The quilt hanger you made for me. Thank you again! I love it! 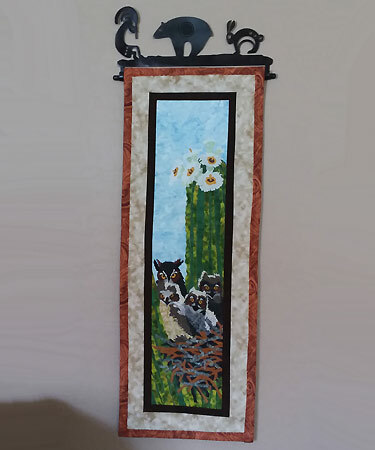 Here's my little wallhanging in the bathroom in Arizona. Hooks look great. 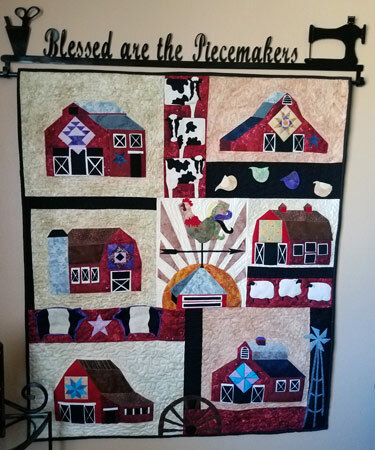 They loved the quilt and the hanger & said to thank everyone who had a part in it. 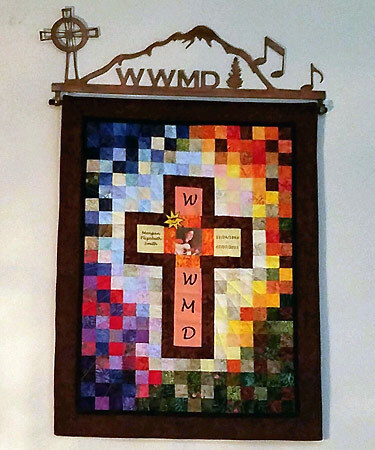 A quilt my mom, Julie Bulkley, made me for my 46th birthday. 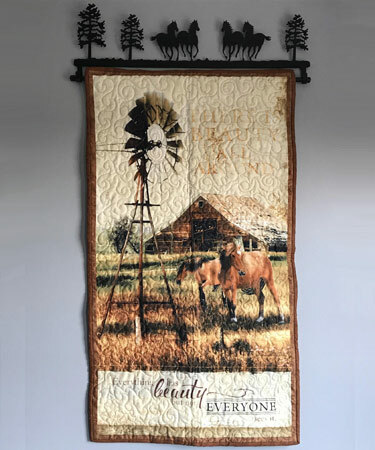 Looks great on your quilt hanger! 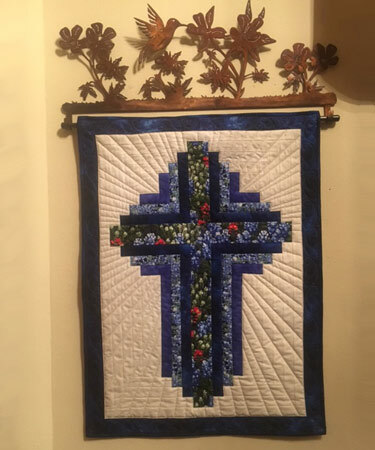 I cannot begin to tell you how much I appreciate you modifying an existing design to work with the size of my wall hanging. As you can see in the attached picture it fits perfectly! 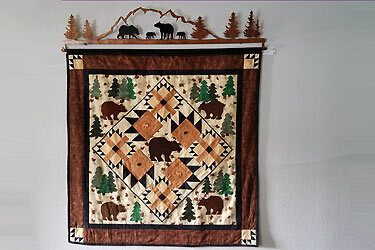 I enjoyed working with you and will definitely be placing another order once I complete my next wall hanging. 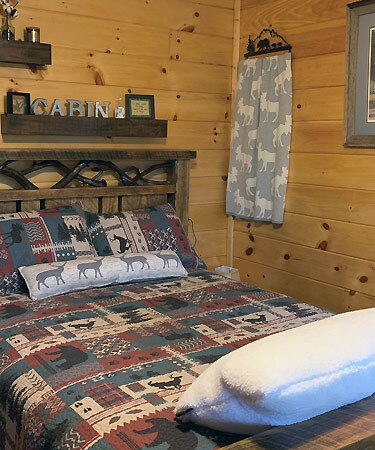 I just wanted to let you know that I love my quilt hanger and I purchased it to cover an electrical box in the bedroom. It was the perfect size and worked perfectly! 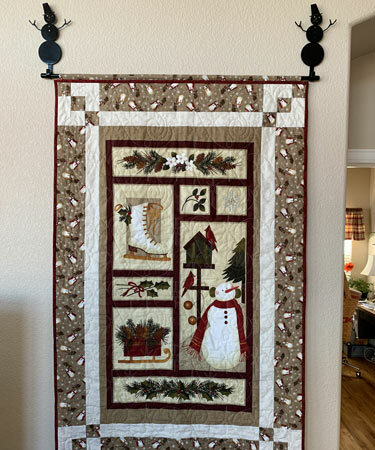 Here are two pictures of the wall hangings that go with the bear and snowman hooks. Thank you for sending them so quickly. I love your products. 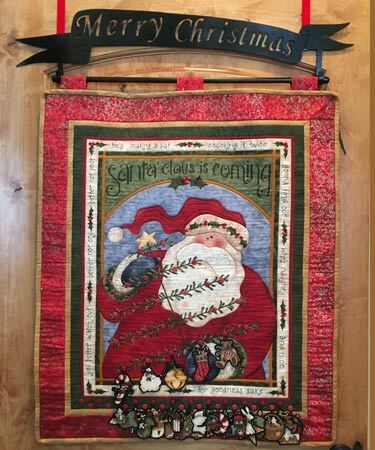 Here is what in made to hang on your hanger. The pits are embroidered using wool and ultra suede. 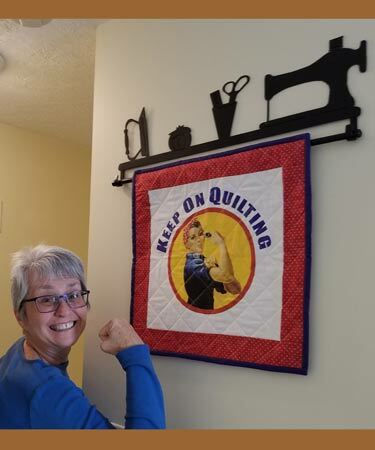 I finally got my quilt from my mother and got it up with the custom made quilt hanger you made for me over the summer. 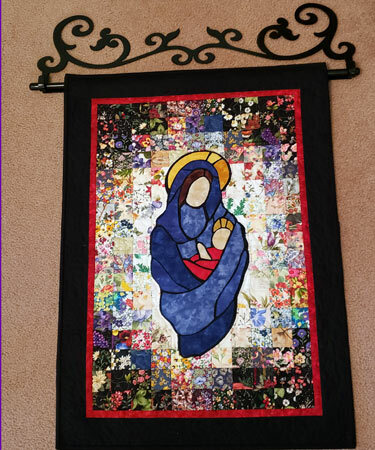 Thank you so much, it looks beautiful with the quilt, I’m the very proud owner of 2 of your hangers. 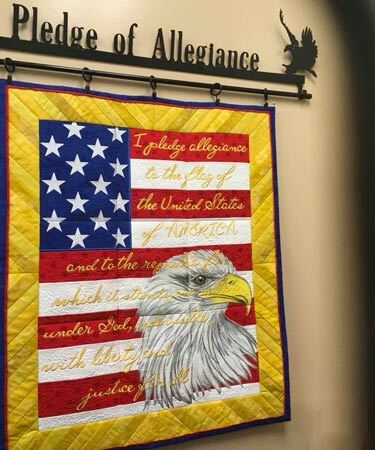 Here it is finally up. It is a little top heavy so we had to use small nails in the header to keep it flat against the wall along with some sticky hangers. Can't thank you enough for the great design!! 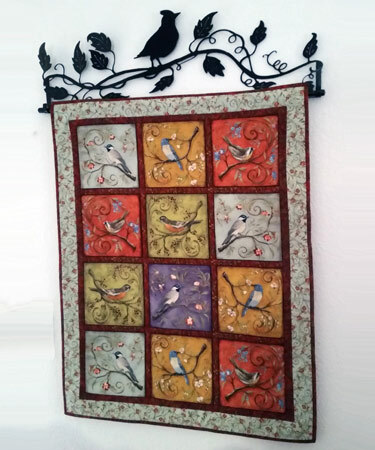 I just received my quilt hanger AND I LOVE IT!!! !